Settled in the serene surrounding of Garhwal Himalayas, Badrinath is the adobe of Lord Vishnu. 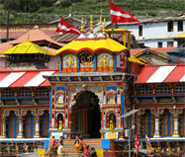 Badrinath Dham is one of the pious sites of Char Dham pilgrimage in India. Other Char Dham sites include Dwarka, Puri and Rameshwaram. The main attraction of this place is Badrinath mandir which houses the one meter tall black stone idol of Lord Badrinaryan. Located in the Chamoli district in the Uttarakhand state, Badrinath is also an important part of Pach Badri Yatra of Uttarakhand. Neelkantha peak in the background, the mystically flowing Alaknanda River and nearby ambiance grace the spiritual environment of this place. The opening date of Badrinath Dham is declared on the prosperous eve of Basant Pachami by the temple priests. The closing dates are fixed on Vijayadashmi. 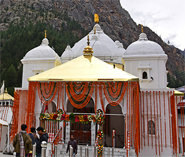 Badrinath mandir gets open in April - May every year and closes in November. For six months every year prayers to Lord Vishnu is offered at Narsimha temple in Ukhimath. Start planning your trip today as Badrinath Dham opening and closing dates for the year 2019 has been announced. Priests very religiously perform pujas at Badrinath mandir. In the morning puja the holy deity of Badrinarayan is covered with sandal paste and decked with fresh flowers. The mangal aarti in the evening creates the perfect divine environment. Mana is a scenic hamlet that is located at China Border of Indian region. It is the last village of Uttarakhand. Tap Kund is a natural hot water spring which is believed to have medicinal values. This place is abode of Lord Agni. Valley of flowers is a national park that is popular for its alpine flowers. It is also UNESCO World Heritage Site and variety of flora is found here. Badrinath one of the holiest shrines in Hindu religion is located in the Chamoli District of Uttarakhand. Badrinath Dham looms at an elevation of 11204 feet on the bank of Alaknanda River. 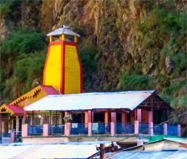 Badrinath Dham is easily accessible by road. It is well connected via road with major cities of Uttarakhand. Regular buses are available from major destinations like Haridwar, Rishikesh, Dehradun and Delhi for Badrinath. The nearest airport from Badrinath is Jolly Grant Airport, Dehradun at a distance of 317km. From here one can board a bus or hire a taxi. The three railway stations that lie close to the Badrinath are Rishikesh (297km), Haridwar (324 km) and Kotdwar (327km). Many taxis and bus services are easily available for Badrinath from these railway stations. Summer is the best season to visit Badrinath. Due to high altitude location, climate here remain cool throughout the year. Heavy snowfall makes the winter bone-chilling. The ideal time to visit Badrinath Dham is May - November. May - June is the peak season where pilgrims in large number rush to visit temple. So, for a hassle-free and quite journey September-October is the best time. During summer the climate gets cool and moderate. Temperature ranges from 7°C to 18° C. Summer months March to June is perfect for the pilgrimage. The charming weather during this season is apt for sightseeing and temple visiting. In monsoon it becomes difficult to travel to Badrinath as the area is prone to landslides. Monsoon starts from July and ends in the September month. Travelling during this season is not easy and requires right guidance. Winter days get chilly in Badrianth. Average temperature ranges around 5°C to 6°C and minimum touches sub zero levels. Winter season starts from November and last till April. During this time of the season Badrinath temple remain closed. 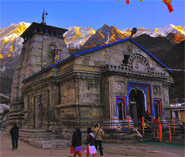 Char Dham are the names of four pilgrimage places in Uttarakhand, India that are widely revered by most of the “Hindus”. The Char Dham of Uttarkhand are: Badrinath, Kedarnath, Gangotri, and Yamunotri.